A documentary is a perilous undertaking, in no small part due to an integral stipulation: that it ought to, in some part, convey events from our world. Films have become, by and large, journeys into the realm of fiction and fantasy, constructions of directorial conceits and desires. The documentary is antithetical to this line of reasoning, and thus is more prone to criticism. Our eyes seek out inconsistencies — and, just as a poorly-integrated piece of CGI may disturb a viewer, so too might an ineptly told story. Otto Bell’s “Eagle Huntress” is split between naturalism and biography, but only the former is handled with any competence. The tale is simple: 13-year-old Aisholpan Nurgaiv wishes to become an eagle huntress, as alluded to by the title, and encounters opposition in her community. There are only hunters, and hunters are only men. 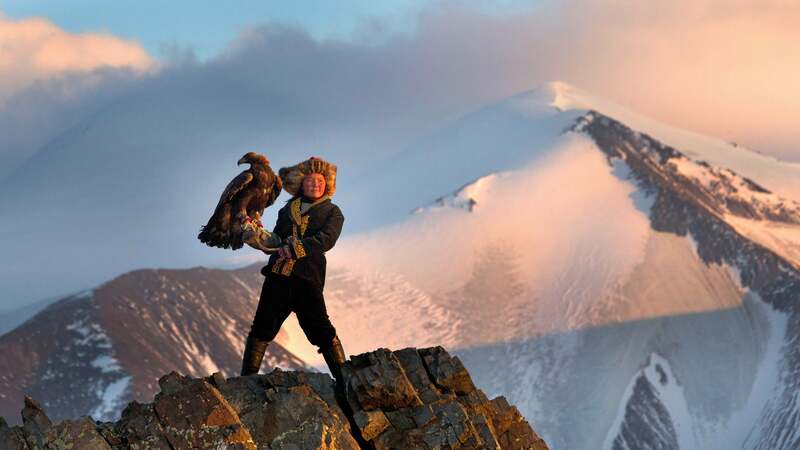 She is, the film claims, the first and only eagle huntress in all of Mongolia. The veracity of her claim is challenged by the local leadership (briefly featured in unflattering, carefully edited interviews). In a series of voiceovers, her father expresses his thoughts on the matter, supporting Aisholpan’s desires in a wholehearted and proud manner. And herein lies the dilemma: The audience is made implicitly aware of the film’s contrived construction. There is no seasonal progression, except when the camera pans over various landscapes during a time-lapse. Nor is there much given to the people the film ostensibly features; an important element of documentary is the recording of lives, of the everyday goings-on of the subjects. A director might construct a narrative, certainly, but the natural patterns of the participants must be established and shot. Here, it is as though Otto Bell came to the Altai mountains with a preordained purpose and ideal story in mind, and imposed it, with undue force, upon the inhabitants. They speak as though they have been carefully instructed on what to say — notably, Aisholpan’s siblings make nary a peep during family conversations. These inconsistencies are the hallmarks of an inexperienced, or amateur, director, and Bell awkwardly incorporates Daisy Ridley (voice pleasant and soothing) as a narrator, dumping information on the audience. Bell’s intentions are earnest and forthright, and one can sense Aisholpan’s investment and love for her chosen profession, along with her parents’ anxieties and hopes. She occupies a unique position and is engaged in the tenuous intersection of tradition and modernity. This conflict is mediated through the stark fact that eagle hunting in Mongolia is a dying art. Less than 250 active hunters remain, and the number shrinks with every year. To Bell’s benefit, the Altai mountains are a remarkable backdrop for his film, and elevate its narrative by their raw, over-awing beauty. He lavishes his camera on long, slow pans of the untrammeled lands. Windblown cliffs crash against the blinding white of snowfall, and the eagles that call the crags home are remarkable creatures, with striking eyes and an intense grace. Larger story or no, one could watch a thousand hours of footage from such a prepossessing land. “The Eagle Huntress” is an uneven piece, shortchanged by Bell’s own shortcomings, but it truly shines when simply observing. Whether it is Aisholpan at work, or performing with her eagle, or Bell is merely canvassing the Altai, this is a documentary better served by its silences than by any overt progression of an artificial plot.